Fall is happening. It’s September, the kids are back at school, and there is simply no escaping it! And while so many of us groan at the thought of cooler days and crunchy leaves, it is nice to know that pretty soon, our handknits are going to come in VERY handy. Which brings us to… Fall trends! What is the rest of the non-knitting world wearing this Fall? And how can we carry those trends over to our craft? First up- the faux fur stole. It’s a known fact that there are a lot of furry yarns out there these days… and it seems that a lot of yarn lovers don’t know what on earth to do with them! And yet, many of us find ourselves gravitating towards those ‘fur balls’ at our local yarn shop, each and every time we walk in. With so many of the faux fur yarns being made so well these days, (they would have any furrier fooled!) it is a great way to incorporate a little ‘fluff’ into your wardrobe, without hurting any of our four-legged friends. Some yarn suggestions? Why King Cole Luxe Fur of course! What a great yarn! Available in a range of multi-textured shades, it has the look and feel of real fur- but it isn’t. And should you want to go really over the top? Why not add some sparkle? King Cole Tinsel is certainly sparkly, and makes no bones about the fact that it is ‘faux’. In fact.. it embraces it! If knitting an entire stole out of fur isn’t for you, then maybe you will want to just throw in a row or two in a scarf, or perhaps as some trim around a button band. A little fur can make a garment ‘a lot’ glam, so don’t be shy to add a touch of it to your next project! 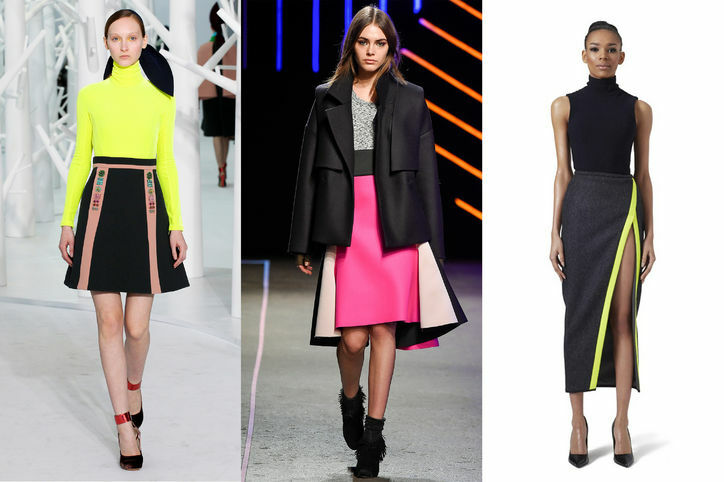 Another trend that has been lingering for a while now, but that we just cannot get enough of is neon! And we’re not talking about the neon of the eighties and nineties, where it was the brighter, the better… We are talking about adding little bits and pops to an otherwise very neutral (and dare we say, ‘tame’?) outfit. When it comes to your knitting, add a neon pompom to your toque, add a stripe of something shocking to a scarf or maybe even knit the cuffs of a sweater in some bright, bold shade all whilst keeping the rest somewhat tame and neutral. It’s up to you! If bright and bold all over is more your style, then what’s stopping you? As far as neon yarns go- Lang has got you covered. Their latest range of sock yarns certainly do glow, so maybe a pair of neon socks, paired with some classic pants and shoes is right up your alley. Mille Colori is also a great choice when it comes to neon and brights (as the name suggests), so why not whip up a scarf to add some POP to your otherwise plain black winter ensemble? That way, you can invest in a fantastic, classic winter coat that will carry you through the years, but follow the trends with your evolving winter accessories. And lastly, some chunky knits. Big sweaters, big cables… What more could you want come the cooler months??? Not only are these on trend- they’re classic! It seems that ‘chunky knits’ hits the Fall Trends shortlist every year. 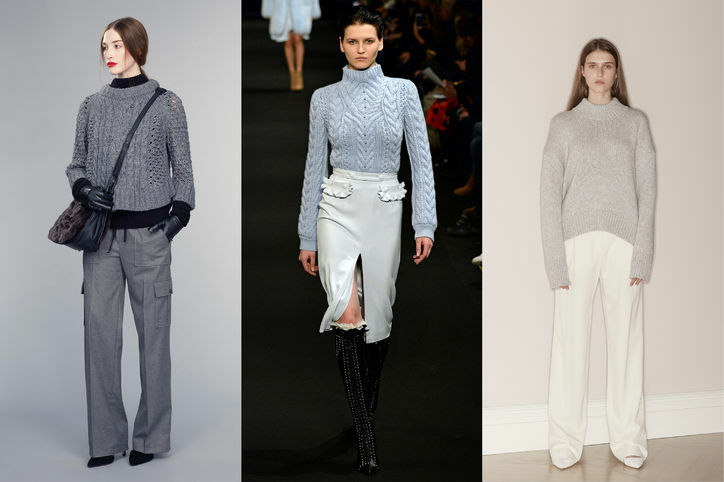 So think of a chunky sweater as an investment in your wardrobe! Lucky for all of us knitters and crocheters, we have some really great chunky yarns at Estelle these days. Cascade Magnum is a classic fave- and an EXTRA chunky option. If you are looking for something that’s not quite so chunky, Cascade Eco Wool is a great yarn. It is chunky enough to knit up quickly, and wooly enough to keep you warm, even on the coldest of days. If you aren’t so into the feeling of ‘wooly-wool’ however, King Cole has a great alternative- Big Value Super Chunky. It is 100% acrylic, and as the name suggests, it is available at a great price point! So there you have it dear knitters. Lots of inspiration for when you feel ready to cast on your next project. Whether it’s furry, neon, chunky, or something completely of your own imagination! It’s sure to provide you with hours of entertainment, and years of wear!